Islanders love their storms and love talking about them even more so. Nature PEI’s Tuesday March 3rd presentation, “PEI – Our Stormy Climate,” is sure to satisfy the storm watchers in the cozy and warm atmosphere of the Beaconsfield Carriage House in Charlottetown. Don Jardine, project manager with the UPEI Climate Research Lab and co-author of the 2015 PEI Weather Trivia Calendar, will talk about historical storms on PEI since the province was first settled, including information and photographs of more recent storms as well as the impact these storms have on coastal erosion. “Our geographic location in the Gulf of St. Lawrence makes our Island province vulnerable to weather systems from Central Canada, the eastern seaboard of the USA and tropical storms which originate in the Atlantic Ocean”, says Jardine, who has worked with the PEI Dept. of Environment for 30 years and has also been involved in conducting climate change vulnerability studies in several communities in Atlantic Canada. The meeting begins at 7:30 pm at Beaconsfield Carriage House – corner of Kent and West Streets in Charlottetown. Everyone is welcome to attend and admission is free. Refreshments are served. 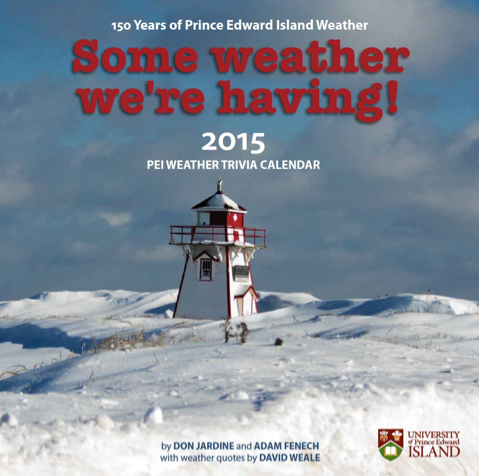 Copies of the 2015 calendar are still available trough the Climate Research Lab at UPEI through the link “Some Weather We’er Having”.